While I was in Charleston, South Carolina for a long weekend with the granddaughters, we joined with over 2,000 walkers to support Water Missions International in their mission of providing fresh water systems in the poverty-stricken areas of the world. At the registration area, walkers picked up empty buckets – symbolizing daily routine of millions of people who must walk over a mile to obtain fresh water. 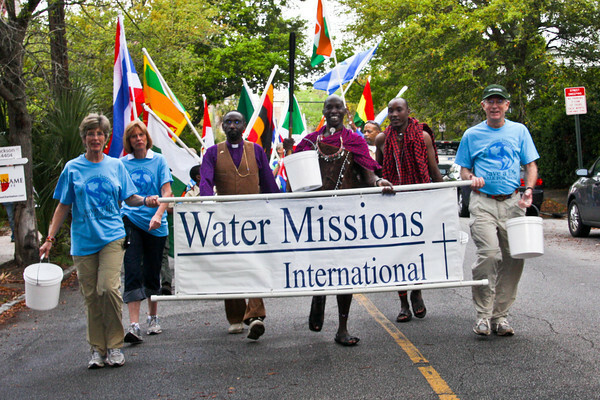 The walk wound through the historic areas of Charleston providing views of the water, old homes, flowers and the Battery–a sharp contrast to the countries where Water Mission International works. 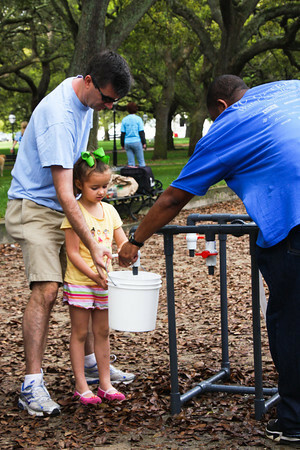 At the half way point of the 3 1/2 mile walk, the buckets were filled with water and the walkers carried the filled buckets to the finish point in a park where the water was made clean through the Living Water™ Treatment System. 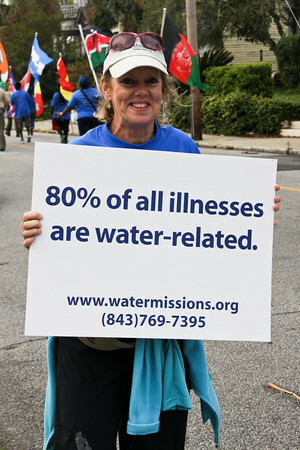 Along the way during the walk, volunteers held signs noting the worldwide health problems due to lack of fresh water and all the obstacles that people face in trying to obtain this most daily necessity. Over 5,000 people die each day due to the lack of fresh and safe drinking water. Bringing a safe water system to a community in poverty changes everything for the people who live there. Once fresh water is readily available, families began to use better sanitation practices. The better sanitation encourages better health. As the community becomes healthier, education follows–all outcomes of having a local source of fresh water. 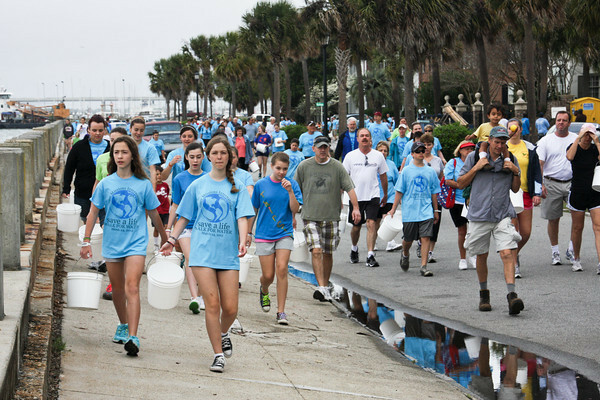 In addition to raising awareness, the walkers in Charleston raised over $200,000 which will be used around the world to bring fresh water to people in poverty. Water Missions International is a nonprofit Christian Engineering Ministry providing sustainable safe water solutions, through a Christian world view perspective, to people in developing countries and disasters. We approach all our work with a sense of urgency and a commitment to excellence. Our faith and our belief in the sanctity of life compel us to develop and implement the best technologies and community development programs so that, through our work, God will be honored and glorified and lives will be transformed for eternity. Since 2001, Water Missions International has responded to the world’s largest natural disasters and daily tackles the world’s single biggest cause of illness – lack of safe water and adequate sanitation (U.N. Report, 2005) by providing safe water to more than two million people in 49 countries. 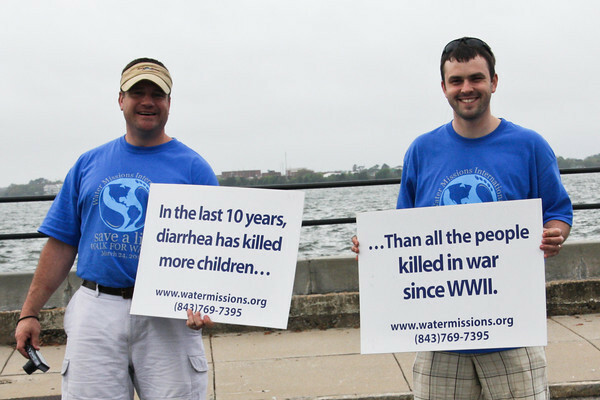 Water Missions International has received Charity Navigator’s top rating five years in a row.